Many other investment sites are shining the spotlight on the upcoming IPO of Snap, the developer of the very popular app Snapchat. [ad#Google Adsense 336×280-IA]But I’m telling you here and now to ignore the hype surrounding this possible $25 billion IPO. Instead, look at other technology stocks that offer investors a much better value. Here’s why I’m passing on Snap. . . . .
First, the company doesn’t think of itself as a social media company. It calls itself a “camera company”. And indeed, late last year, Snap launched its first hardware product – video sunglasses dubbed “Spectacles”. These sunglasses are being sold from roaming bright yellow vending machines, with one large eye, called Snapbots. The specs, priced at about $130, will record what the wearer sees and upload that to the photo app. There are reports though that we may have another case of combustible technology. It seems that some spectacles melted from excessive heat while in the re-charging case for about 30 minutes. Why would a company with an app so popular among millennials – and that have advertisers salivating – move in another direction is beyond me. There are worries too that its growth is already slowing. 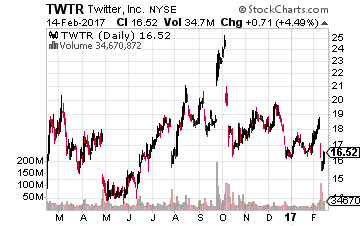 That is bringing up comparisons among some that Snap is not another Facebook (Nasdaq: FB), but another Twitter (Nasdaq: TWTR). Its proposed valuation is scary too. 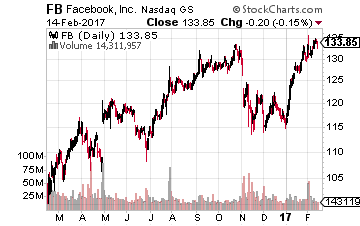 Facebook is valued at fourteen times sales. Twitter at a mere four times sales. But Snap’s pending IPO is valued at a whopping 60 times sales! That brings me to its share structure. Snap will have three classes of shares with different voting rights. The C shares, controlled by the company’s two founders, have 10 votes apiece – giving the founders full control. The B shares, owned by early investors and employees, have one vote each. The A shares – the ones offered in the IPO – will have no votes. This has angered many major institutional investors that will likely pass on the IPO. And so will I. Instead, I will look for established technology companies that offer investors a better “deal”. I’m not opposed to companies with share structures skewed toward the founders. As long as such firms treat their regular shareholders well. 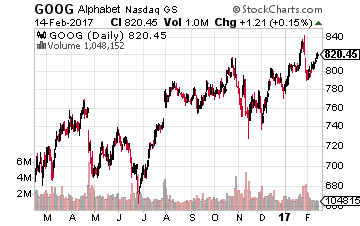 One such example is Alphabet (Nasdaq: GOOG), which has built the world’s largest advertising business. In the latest quarter, its revenues grew by 22% to $26.1 billion. That topped Wall Street estimates. While most of that revenue came from ads, it is slowly diversifying its revenue base away from ads. Hardware, the cloud and You Tube come to mind. What I really like though is its growing maturity as a company. On its last conference call, Google let it be known that it would no longer play games with its earnings as so many tech companies do. It said it will recognize the cost of stock-based compensation. That is such a rarity. Even Facebook relegates GAAP earnings to a mere footnote in its earnings report. Although Amazon (Nasdaq: AMZN) did away with non-GAAP earnings a while ago. However, many firms – such as Salesforce.com (NYSE: CRM) – only look profitable thanks to pro forma earnings instead of GAAP earnings. This move by Alphabet only moves it up the list of my top tech stocks. 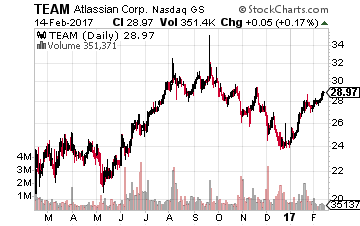 The next stock I’d like to talk about is the Australian provider of workplace and social task management software tools for teams, Atlassian Corporation PLC (Nasdaq: TEAM). It is well-known in the world of software developers and IT workers. Some of the components of its toolbox include project management tools, a messaging service and a document sharing service. Its two most popular products are JIRA and Confluence. Atlassian is rather unique in the technology world. It was started in 2002 by two Australian university students with $10,000 in credit card debt. It received no funding from Silicon Valley or from other outside equity investors. And most importantly – the company has been profitable from its inception! It has done fairly well stock-wise, up about a third from its IPO price in December 2015. I like the fact that the company spends about half as much of its revenues on sales and marketing when compared to rivals such as Salesforce. It instead relies a lot on word of mouth – another anomaly in the tech world. And Atlassian is definitely in a fast-growing sector – the enterprise application software market. Research firm Gartner says the sector (web conferencing, collaboration and social software) was a $4.7 billion market last year. It forecasts that to grow to $7 billion in 2020. Atlassian is expanding its toolbox to participate in that growth. It recently bought collaboration service Trello for $425 million. Trello has nearly doubled its registered user count just since October 2015. Most of users are outside the world of geekdom. More than half of Trello’s users are in sectors including finance, human resources, legal, marketing and sales. That leads me to be even more confident in the future growth of this out-of-the-norm tech company from Down Under. I expect it and GOOG to outperform the underwhelming Snap IPO in the long term.